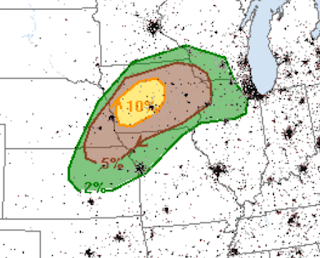 Here is the SPC's tornado outlook for later today. Five percent (brown) is the threshold of a significant risk which extends from Manhattan, Kansas, to far southwest Wisconsin. There is a 10% area (double the risk) that includes Omaha, Council Bluffs, Des Moines and Ames. The risk is defined as the chance of one or more tornadoes within 25 miles of any given point. There is also a risk of very large (2" diameter or greater) hail in the hatched area. On the hail map, the significant risk is 15% (yellow) which extends from Wichita to the Chicago suburbs. 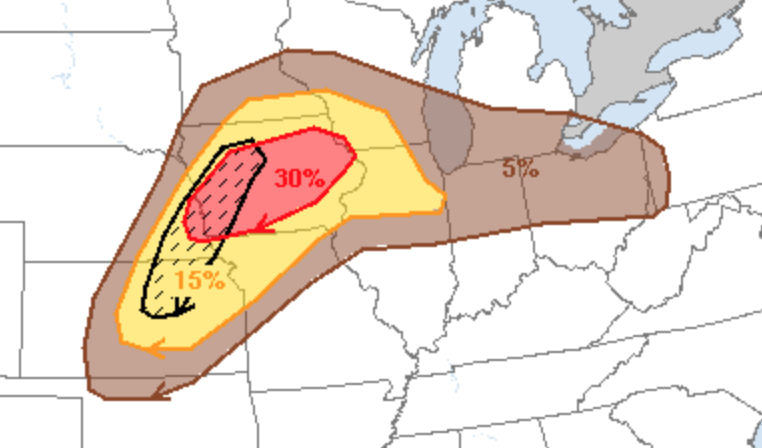 The 30% area (red) is a pretty high risk. If you live in, say, Omaha (hatched + 30%) you'll really want to put your car in the garage.